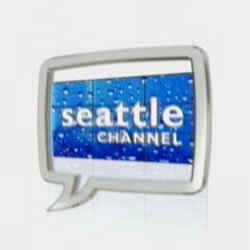 The Seattle Jazz Composer’s Ensemble presents: Composer Chat! SJCE talks with Seattle composers in their environments about music and the music making process. And we have coffee. 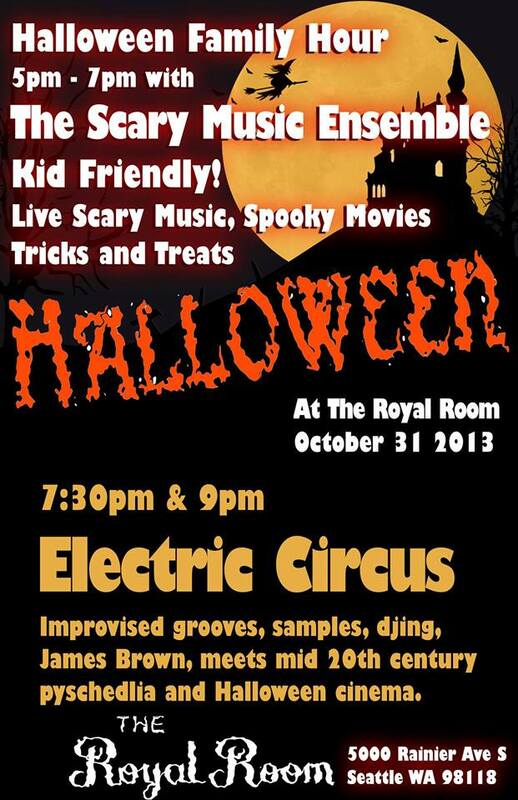 Following is Electric Circus (7:30 & 9pm) playing improvised grooves, samples, djing, mid-20th century pyschedlia to Halloween Cinema with an all-star band of improvisers led by Wayne Horvitz. Two distinctive composers on the Seattle scene, clarinetist Beth Fleenor and trumpeter Samantha Boshnack, showcase their works for large ensembles in one of the city’s finest concert rooms. B’shnorkestra will play promptly at 8:00 followed by the WE Ensemble. B’shnorkestra is an alternative chamber orchestra featuring the compositions of trumpeter Samantha Boshnack. In August they released “Go To Orange”, their first CD release. At this show they will be playing pieces from the record as well as three new compositions. B’shnorkestra features; Joshua Kohl, Samantha Boshnack, Alex Guy, Alina To, Brianna Atwell, Maria Scherer Wilson, Daniel Mullikin, Tobi Stone, Chris Credit, Adam Kozie, Greg Campbell, Isaac Castillo, Tim Carey and Lalo Bello. 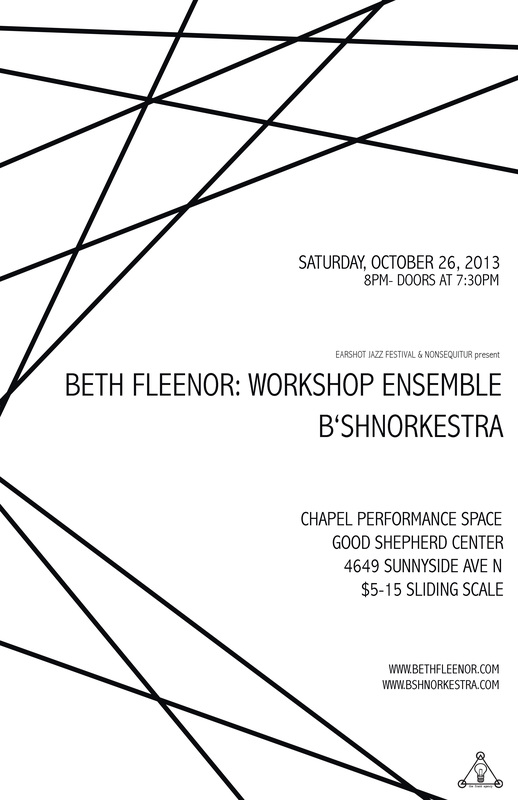 Hailed as “alternately buoyant and ponderous, transfixing and exceptional” (City Arts Magazine), Beth Fleenor’s Workshop Ensemble is a modular project that performs her chamber works. Grounded in learning and working Fleenor’s 20 Etudes for Blindfolded Musicians, WE also work in conduction and sonic meditation. Through the use of blindfolds to heighten full body listening/awareness, WE cultivate focused intention, highlighting that intention as a respected member of the ensemble, in a practice of non-visual, non-verbal empathic communication. For this performance WE will feature Michele Khazak (voice), Brian Bermudez (tenor), Chris Credit (bass clarinet), Sam Boshnack (trumpet), Naomi Seigel (trombone), Michael Owcharuk (piano), Geoff Larson (bass), Greg Campbell (percussion), Adam Kozie (drums), and Beth Fleenor (clarinet, voice, composition). 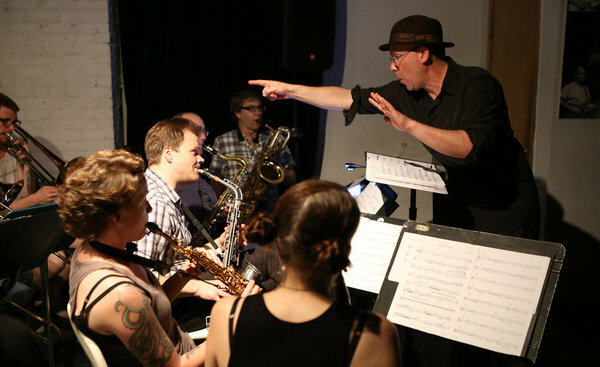 Wayne Horvitz’s “conduction” employing large ensemble plays the Earshot Jazz Festival tonight, in a double bill with an exceptionally beautiful young brass quintet: the Westerlies. Really, any opportunity to hear Horvitz’s music is special, but hearing him compose in real time with this ensemble of stellar players can really be alchemical. Composed as a conducted arrangement, spontaneously weaving together improvisation and written components, SILT is a meditation that seamlessly grows, climaxes, and diminishes over a 7-30 minute exploration of 8 interlocking parts. Commissioned by the Seattle Jazz Composers Ensemble and UMAMI Performance in 2012, SILT was created for music and dance to affect and trigger each other in real time, in a work that also stands alone as a sonic meditation. SILT achieves this through the use of Conduction or a form of conducted improvisation including set cells of material. The Workshop Ensemble*, which was created to present this and other exploratory, intention based works – including practice in the Etudes for Blindfolded Ensemble – recently recorded this work as part of Jack Straw’s Artist Support Program. After a brief talk about the blindfolded process, Conduction (Fleenor has studied & practiced various styles with numerous artists over the last decade) and other focusing agents, we will listen to SILT blindfolded and with the score. *Workshop Ensemble (WE) are Michele Khazak (voice), Kate Olson, Brian Bermudez, Chris Credit (reeds), Sam Boshnack (trumpet), Naomi Seigel (trombone), Michael Owcharuk (piano), Geoff Larson, Evan Flory Barnes (bass), Greg Campbell (percussion/horn), Adam Kozie (drums), and Beth Fleenor (clarinet, voice, composition). SHOWS 10/23-25/15 KARIN STEVENS DANCE + SAM BOSHNACK QUINTET BACK BY POPULAR DEMAND! WAYNE HORVITZ CELEBRATES 60TH BIRTHDAY WITH 52 WEEKS OF BACK CATALOG RELEASES!